There are few things more empowering than building your own beautiful, ecological home or adding personal touches to the one you already have. With carpentry know-how, you can have the satisfaction of living each day surrounded by reflections of your own creativity and resourcefulness. What’s more, tiny houses are efficient, flexible and offer the security of home ownership to folks who thought it was out of reach. In our building classes you can learn these skills and create the handmade home you’ve always imagined. Our carpentry and building classes bring together natural and sustainable materials, smart designs, and practical skills. Not everyone grows up learning construction, but everyone can do it. We bring years of experience to the table, offering clear, accessible guidance that leaves you feeling confident. At the end of our home building workshops, you’ll be ready to tackle a project that you didn’t know how to when you began. Every fall, we offer a tiny house workshop that goes way beyond the basics. Woven throughout the 8 full days of hands-on and theoretical instruction are the natural building modalities that we love and value. In this home building workshop, we explore a bunch of different tiny houses. There’s a lot of time to talk about design, because we know everyone’s needs and visions for their homes are different. Together, we put the ideas into action and build an actual tiny house as we’re learning. If you want to own your own handmade home, this course will get you well on your way. Our interest in building came out of a broader interest in the balance, harmony and beauty of sustainability. 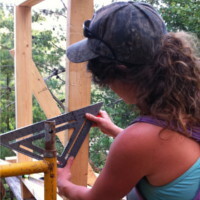 We’re excited about the intersections between carpentry and permaculture. 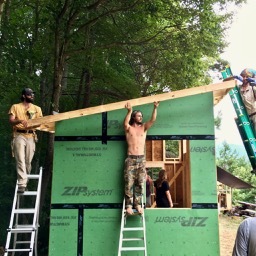 In fact, we can’t help but bring permaculture principles into our home building workshops, and building skills into our Permaculture Design Certificate Immersion Course. Human beings (the vast majority of us anyway) live in structures, and those structures play a major role in our day-to-day lives. How our buildings fit into the ecosystems of our homes, homesteads, farms and communities impacts how those bigger systems work. When we have the skills to design and build structures that fit in smoothly, efficiently and beautifully, the whole system benefits. When we build and repair our structures with our own hands using local materials, we disentagle ourselves from the extractive global economy and increase resiliency. 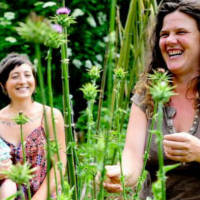 If you want to become a Permaculture Apprentice here at Wild Abundance, you can learn all about building and sustainable systems first hand. Every apprentice lives in a handmade structure and has access to all of our beautiful, custom-made facilities. They also get to participate in our home building workshops, including the tiny house course. Let’s be real: Female-bodied people typically don’t grow up learning building skills. And it’s not always easy for women to jump into male-dominated projects to learn as adults. That’s why we offer two special home building workshops just for women. For those who feel nervous wielding a hammer or drill, our introductory women’s carpentry course meets you where you’re at. We teach basic tool use and safety, give lots of practice time, and every student gets to create their own small project. 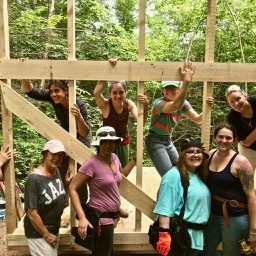 For those with some familiarity with tools and carpentry but who don’t feel confident constructing buildings, our advanced women’s carpentry class goes a step further. From foundations up, we cover everything that goes into designing and building strong, stable structures. The spaces that we occupy and the objects that we’re surrounded by are important for so many reasons. Houses are the containers for our lives; their design and feel dictate the ease (or lack thereof) of our daily activities. Want a sunny kitchen? Need a bookshelf to fit just right into that tight corner? Want to get your garden tools organized without hiring someone to build your shed? All these things, and more, are possible. We are here to help you make them a reality.